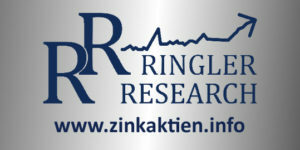 Ringler Research, the information portals uranaktien.info, uraniumstocks.info, silberaktien.info, silverstocks.de, zinkaktien.info, zincstocks.info, edelmetallaktien.info , preciousmetalsstocks.info, mining-research.de and mining-research.com are brands of Ringler Consulting and Research GmbH. On the platforms, interested parties can keep up to date with the latest sector news, trends and company news. Our research boutique offers a wide range of consulting services for mining companies and institutional capital market participants. This includes the generation of bank-independent research reports, specialist articles and interviews, which are made available to hundred thousands of market participants through a variety of channels and content partnerships. We also structure complex IR/PR campaigns with the goal to increase world-wide market awareness for existing and potential new investors. Special Gold Alert: Is The $1456 Handle Possible In 2019? USD / JPY (H4) – Plan ging auf! Sehr ruhig! Er scheint gefangen!